Bump to Baby $375 Includes:	1 hour maternity session	2-3 hour newborn session *on location prices available upon request* Information: Each session includes an online viewing of your photos; we carefully compare the hundreds of images from your session to select the best images from each concept. Then we will meet with you to review/select your photos. All images purchased are fully retouched. Maternity sessions are available alone, with your partner, and/or other children or family. Dress in whatever is most comfortable for you; form fitting outfits, loose dresses, etc. We’ll help with styling and posing, and apply our expertise in artful lighting and editing to bring out the best in your maternity portraits. Newborn sessions are best within the first 2 weeks of life; 7-10 days is optimal. Bring any items that are personal for you, while we have many props available to use, it’s great to personalize your own photos. You can now relax and enjoy while PhotoOp’s team soothes your newborn baby and create classic images. We have a million soothing, swaddling, wrapping and ssshing techniques and we really do not want parents to worry. We also suggest feeding your newborn right before the session. 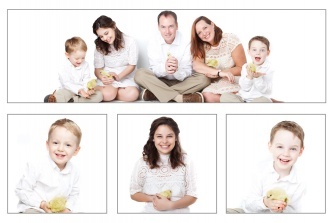 mini -30 minute- sessions every spring with live baby chicks! Subscribe to our emails and be on the look out come March/April!